On a roster full of questions marks, the outside linebacker position at Nebraska stands out as one of the most intriguing position battles in fall camp. 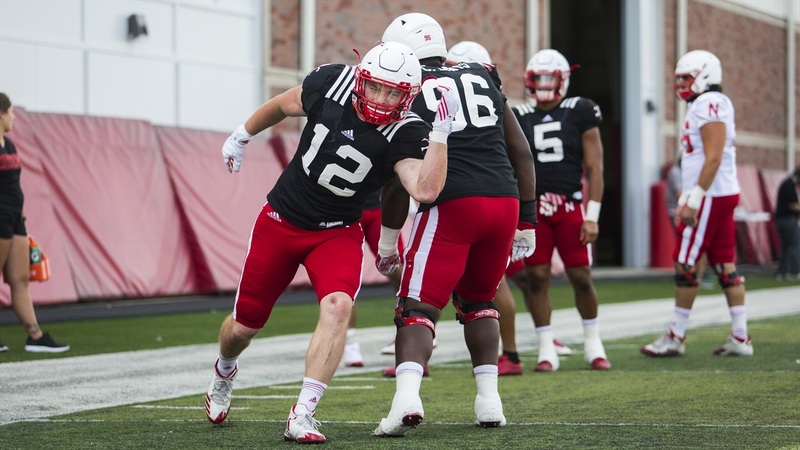 Nebraska needs more production out of that spot than it got last season, but there are plenty of signs early on in camp that defensive coordinator Erik Chinander and outside linebackers coach Jovan Dewitt will get just that. A big part of that is the return of Luke Gifford, the senior from Lincoln Southeast who looked like one of Nebraska’s best defenders as a junior before seeing his season cut short by injury after just seven games. After missing spring ball, Gifford is back on the field, although the coaches are easing him back into the swing of things. Early as it is, Chinander has already seen flashes from “the old man” that has him excited. One outside ‘backer who made the most of Gifford’s absence in the spring was junior Tyrin Ferguson, and Dewitt said the 6-foot-2, 230-pound linebacker from New Orleans has only picked it up even more to open fall camp. After practice, sophomore outside linebacker Collin Miller echoed Dewitt’s thoughts on Twitter. Ferguson began his Nebraska carer at middle linebacker in a 3-4 defense, contributing solely on special teams, then redshirted his second year on campus. As a sophomore last season, he was back at his more natural outside linebacker spot in Nebraska’s 3-4 defense, playing behind Gifford and Marcus Newby at the field side position. He appeared in five games, dealing with injuries of his own. However, praise for Ferguson has been consistent throughout the spring and now fall and he appears to be poised for a breakout season as a perfect fit for Nebraska’s new defense and new culture under Scott Frost’s staff. Another player that has popped so far is Caleb Tannor, the pass-rusher out of Georgia who was one of the top-rated recruits in Nebraska’s 2018 class. So far, he’s lived up to the yep and then some in Dewitt’s eyes. “I think he’s exceeding a little bit almost some of the expectations in terms of some pass-rush ability,” Dewitt said. “He’s got some natural football acumen, which is really nice, because a lot of times when freshmen come in and you’re expecting a lot out of them, sometimes the mental aspect takes over and they kind of struggle a little bit. I think Caleb’s done a really good job of attacking the meeting room and getting an understanding of where he needs to fit. Outside of Tannor, a few others have jumped out to Dewitt in terms of pass-rush ability including Gifford who was something of a swiss-army knife for the defense last year. Junior inside linebacker Mohamed Barry highlighted the same players Dewitt did when asked about which outside ‘backers have stood out to him so far: Davis, Ferguson, Dixon and Tannor. With so many players popping early and several others trying to earn playing time, how many of them does Dewitt anticipate rotating in an an ideal situation? Nebraska is still a long ways off from identifying who that core five is at outside linebacker, but a handful of players appear to have made a strong case for themselves to this point.